Editor’s Note: Over the last couple of weeks, a debate has waged among Havok Journal fans about the utility and appropriateness of sharing the experiences of war. On the one hand, some think that veterans not only have the right, but the obligation, to tell their fellow citizens about the wars waged on their behalf. On the other hand, some veterans feel that discussing the intimate details of warfare violates both directives and cultural norms of the military. Both arguments have merit. As part of the continuing discussion on this topic, we are bringing you excerpts from Professor David Chrisinger’s blog “Stronger at the Broken Places,” from 2014. For the past couple of years, I’ve been trying to piece together my grandfather’s narrative — the “truth” about what happened to him during the Battle of Okinawa. Before I started my research, I knew next to nothing of his experiences, yet I know from his behavior that something must have happened. For him, the war did not end on the battlefield — it followed him home and had a life-changing effect on both him and his family. The trauma he survived reverberated through the generations, leaving no one in our family unaffected. A couple of months ago, I discovered that my grandfather’s battalion’s “Operational Report” was being stored at the National Archives in Washington, D.C. I contacted one of the archivists there and they sent me copies of those records. Shortly after the war ended, a small group of Army historians set out to write the official history of the Battle of Okinawa. The resulting book, Okinawa: The Last Battle was based not only on records like the ones I had found, but also on (1) manuscript histories of the units that fought there; (2) interviews with the combatants; and (3) official records, including Japanese records and prisoner-of-war interrogations. What did my grandfather have to say about this battle? He never told anybody about what happened that day. 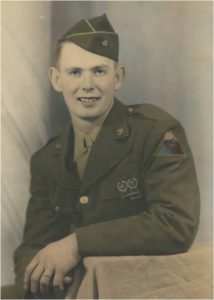 Like most men in his generation, my grandfather preferred silence to expressing how he felt about the horrors of combat and the struggles and emotions of coming home. I wish he had met someone who could have helped him tell his story and share it with others. After all, if your life does not become a story, silence will become the story of your life. If you are interested in sharing your voice with our community, please email a brief bio, a few photos to use as it relates to the article, and a word document with your story to havokjournal@gmail.com or havokmedia@havokjournal.com. We may ask for your DD-214 (sans SS#) to do our due diligence that you served our nation honorably. Thank you for being a voice in the Veteran community.